Teens and young adults are now turning more frequently to the use of e-cigarettes or vape pens in place of cigarettes. This trend may be in part due to the nicotine-free options, the candy flavorings, or the ‘cool’ factor of the devices themselves. Most discussions centered around e-cigarettes or vape pens focuses on the harmful effects of nicotine, but even nicotine-free options can still damaged lung tissue and potentially cause long-term health problems. Teens love that e-cigarettes come in a wide range of fruit- and candy-flavored options including flavors like pineapple, cotton candy, cinnamon, cherry, and more. A new study recently published shows that even without the presence of nicotine in vaping liquid, the flavorings themselves may still be a toxicity concern. The flavors are safe to ingest as the digestion process breaks down the chemicals, but vaporizing and inhaling these flavored vape liquid can introduce cancer-causing chemicals into the body. It appears that cinnamon-flavored liquids have the most potential to cause harm. A study showed that nicotine-free e-cigarettes still included harmful substances, chief among them include acrolein. Vaporizing and inhaling this chemical can cause lung inflammation in the short term. More studies need to be done to determine the effect in the long term, but these results do point to effects that suggest there is the potential for long-term lung damage from vaping nicotine-free e-cigarettes. For middle school and high school aged children, there appears to be a link between vaping and the increased use of tobacco products like cigarettes. While e-cigarettes may pose fewer adverse health effects than traditional cigarettes, they do appear to encourage teens to begin using tobacco products that do contain highly addictive nicotine. 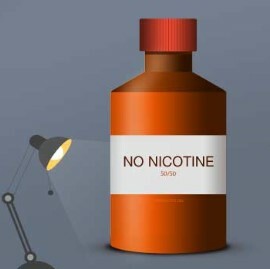 Inhaling too much nicotine can give the user a sick feeling that encourages them to reduce their use of an e-cigarette or vape pen, but without nicotine, it is possible for a user to increase the amount they vape and expose themselves for long periods to the other potentially harmful chemicals included in vape liquid. Nicotine isn’t the only dangerous chemical that is found in e-cigarettes. Over time, the types of cell damage caused by the chemicals even in nicotine-free e-cigarettes can lead to fibrosis, chronic obstructive pulmonary disorder, and asthma. While e-cigarettes might be slightly less harmful than cigarettes, they are certainly not harmless, even without nicotine.